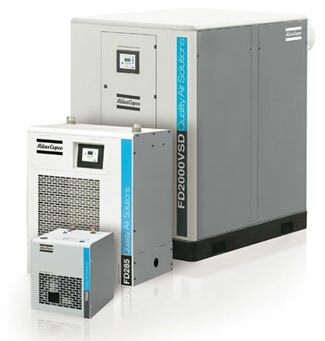 Atlas Copco FD Series Refrigerant DryerClean and dry compressed air: it is vital to power up your busy production environment. Containing moisture, aerosols and dirt particles, untreated compressed air poses a substantial risk as it can damage your air system and end product. Incorporating unique, patented technological innovations and extra energy-saving options, Atlas Copco’s FD refrigerant dryers provide you with the clean, dry air you are in need of to expand the life of your equipment and ensure the quality of your end product.